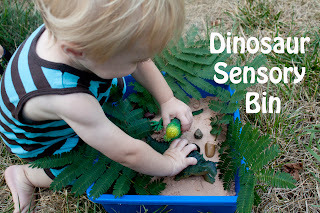 While the girls were on their Dinosaur Dig, I gave Eli this little sensory bin with his bigger dinosaurs in it. I wanted to use cloud dough for the base of it, but since it was for Eli, I wanted it to be edible. I used the recipe I found on My Heart Felt Attempts and doubled it. So I used 3 1/2 C flour, 1/2 C cocoa, and 1/2 C vegetable oil. It wasn't quite as smooth and silky as the baby oil version (Original Cloud Dough), but it was much safer! I added some little rocks and a couple of soft fern leaves that I found growing outside. Eli had a great time walking his dinosaurs around in the cloud dough. The leaves were quickly discarded, and the rocks were buried. He tried big dinosaurs and little ones. He saw the girls digging with shovels and decided to give that a try too. He shoveled a lot of it out onto his lap. Then the girls decided to help. They patted it and played in it for a while, and then they were off to the water table again. Eli proceeded to dump the cloud dough on himself. Then the girls thought it would be fun to add water to the little that was left in the container. Adding water made it feel very smooth! Then it was dumped, and that was the end of the dinosaur sensory bin.